Despite all the talk of immersive cinema, new technologies that are meant to make film more immediate and grand, perhaps no movie franchise is more immersive than the Mission: Impossible films. 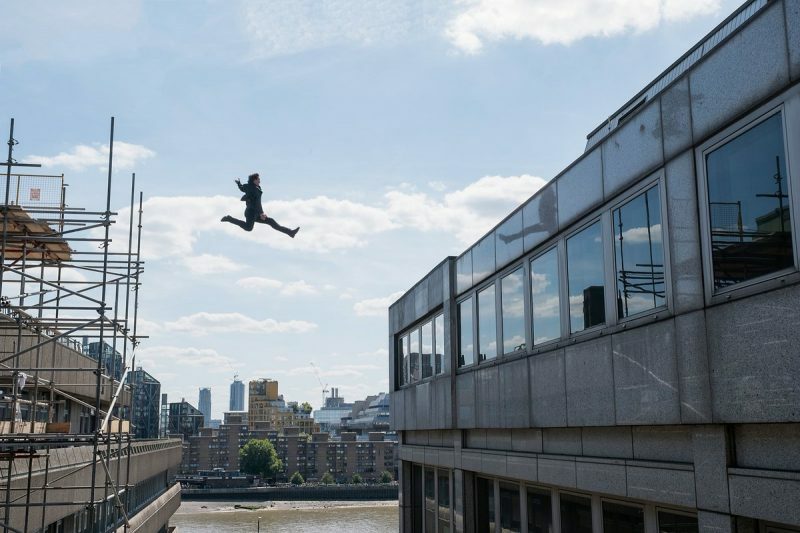 The newest, Mission: Impossible – Fallout, is the strongest and most exhilarating entry in a series that is remarkable for its level of quality. You can see it on a giant screen (as you should), or you could go to one of those silly theaters where the chairs shake like some disappointing theme park ride, or you could project it in completely unnecessary 3D — no matter the circumstances, once Fallout gets going, it takes control of your adrenaline and pumps it mercilessly. The comedown, that feeling of exhausted calm that occurs at the conclusion of the film’s most intense set pieces, is so intense that you’ll almost feel like you were the one hanging off the edge of a cliff. 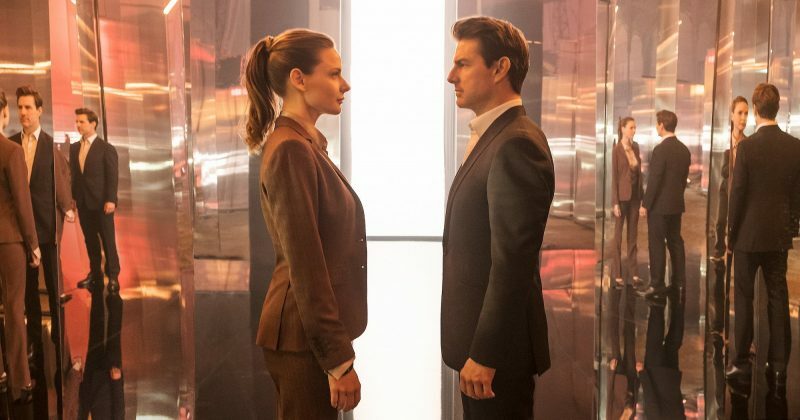 Thanks to a mostly talented crew of writers and directors, plus the presence of a lead actor who seems to have no limits to what he’s willing to do for the camera, the Mission: Impossible franchise found a sweet spot between the hammy fun of old James Bond movies and the breakneck thrills of the best suspense films. Instead of Bond’s casual sexism and womanizing, gadgetry and masks take the fore. Cruise, seemingly one of the most fearless actors ever, tempers the series’ silliness with his commitment to stunt work. By doing so many of his own stunts, the camera is able to follow him intimately. We see the (possibly real) look of fear on his face as he accomplishes these feats, and it’s hard not to feel like we’re right there with him. While watching Fallout, I had the thought in the back of my mind that everything would work out, because of course it always does in these films. The great strength of Fallout is that telling this to yourself doesn’t ease the tension even one bit. Aside from its quality, Fallout is unique among the M:I films — it’s the only one that serves as a direct sequel to the previous entry, Rogue Nation (2015). There has always been a limited amount of carryover, mainly in the presence of Ving Rhames (the only actor to appear in each film besides Cruise), but the recent films have begun to toy with a greater sense of continuity and cast members that appear in multiple films for further character development. Since Brad Bird’s Ghost Protocol (2011), all seem to be of a part; this separates the earlier films from the later, more organic entries. Like most entries in the franchise, a McGuffin sets the story in motion. Ethan Hunt (Cruise) is on the trail of three orbs of plutonium being sought out by a quasi-religious doomsday cult known as The Apostles. Their story is one of the few disappointing parts of Fallout, a capitulation to the current popularity of plots about villains who wish to reinvent the world by first destroying it. It’s an understandable choice for writers to make — by giving your villain the false sense that they’re actually saving the world, it helps to humanize them. But this trope has worn itself out now, reaching its logical extension in this year’s Avengers: Infinity War. It’s time for film writers to reexamine their villains. Bad guys don’t need to be understandable to be compelling, nor do they need to be motivated by false nobility. People commit horrible crimes every day for far less grandiose reasons. It’s a movie that is so successful that it calls the future of the franchise into question. Where can they go from here? How can they top this? Luckily, The Apostles want to free Solomon Lane (Sean Harris), a far more intriguing evil doer introduced in the previous film. Cruise, along with most of the returning cast, must try to capture Lane and the plutonium, even as they’re pulled in separate directions. Making matters more complicated is the presence of the CIA. 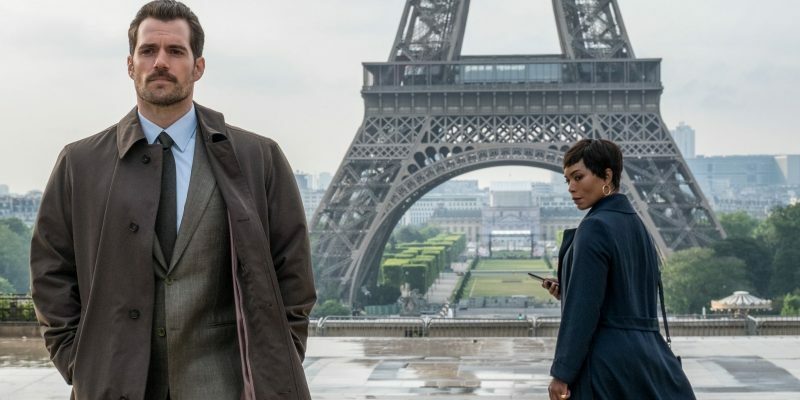 The agency’s director (played with detached cool by Angela Bassett) has sent the ridiculously named August Walker (Henry Cavill) to ensure that Hunt stays on task. Cavill is a woefully wooden actor (sometimes he makes Superman seem downright relatable), yet his imposing figure is put to great use in the action sequences. Christopher McQuarrie, who both writes and directs, has taken a different tack from Rogue Nation, which he also helmed. There’s a greater focus on Hunt’s inner life and his feelings for his wife, Julia (Michelle Monaghan), as well as Ilsa Faust (Rebecca Ferguson), the assassin who fascinates him. There are multiple dream sequences that delve into Hunt’s feelings, and Cruise displays a tenderer version of the character than we’ve ever seen. McQuarrie and cinematographer Rob Hardy also favor a darker palette, even more so than the previous film (shot by the great Robert Elswit). It’s reminiscent of Christopher Nolan’s remake of the Batman series. McQuarrie and Cruise don’t go so far as to make Hunt a brooding figure obsessed with the past, but they at least inject a bit of emotional depth where previously there was none. But more than anything, what makes Fallout so compelling is its elegant structure. McQuarrie’s writing features some real clunkers (as it did on the last film), but his sense of structure has only gotten stronger. Every action set piece has to be larger and more momentous than the previous one — not just in terms of the action, but also the stakes. Somehow the film finds all the right moments to ramp up the tension, yet it also knows just when to cool things down and give us a breather. It’s worth comparing Fallout to J.J. Abrams’ misbegotten Mission: Impossible III, which actually contracted during the final action sequences, ending with a whimper. Here, Cruise performs one of the most astounding sequences of his career to cap the film off. With Fallout, it’s clearer than ever that the Mission: Impossible films now fall into two distinct epochs: the auteur films and the journeyman films. The first three are all inextricably tied to their directors — Brian De Palma, John Woo, and Abrams. De Palma’s gonzo paranoia, Woo’s balletic fight scenes, and Abrams’ inexplicably shaky camera are all unmistakable signatures. The three films are the work of three different directors trying to make their mark. The latter three films are more anonymous, but also more tightly controlled. Bird is a director with a distinguishable style, but he casts it aside for the very well made Ghost Protocol. McQuarrie does similar work with his two entries. There’s no obvious visual or auditory clue in the films that they’re directed by McQuarrie, but his sense of timing and build-up is so impeccable that it doesn’t really matter. Still, it’s hard not to wonder what the future of the franchise might be if they let a real auteur back into the fold, one who not only has their own distinctive style, but also has a commanding understanding of action and tension. Imagine what might happen if Steven Soderbergh were to take over, a director with style to spare, and a keen understanding of both experimental and commercial cinema. But that’s a film that doesn’t exist, whereas Mission: Impossible – Fallout is quite real. It’s a movie that is so successful that it calls the future of the franchise into question. Where can they go from here? How can they top this? For the time being, though, let’s just celebrate this ode to the power of adrenaline.